Inactive Ingredients: sterile water (opthalmic grade isotonic solution pH 6.3 to 6.4), N-acetyl-carnosine, potassium bicarbonate, citric acid, boric acid, benzyl alcohol (preservative). Ortho• Eyes is a revolutionary and natural solution for aging eyes. The active ingredient is N-acetyl-L-Carnosine. Carnosine is an amino acid known to help reduce damaged, dysfunctional proteins called AGEs (advanced glycation end-products). AGEs render tissues dysfunctional, resulting in various health problems. Acetylated carnosine is better absorbed than regular carnosine and is extremely effective when applied directly to the eye as an eye drop. Primary Uses: Ortho• Eyes drops help improve vision in age-related eye disorders such as cataracts. The formation of AGEs in the eyes is a significant problem in cataract formation and age-related macular degeneration. Studies have demonstrated that topical N-acetyl-carnosine eye drops alleviate eye tiredness, improve vision, reduce cataract severity, relieve corneal dystrophy, hasten recovery from corrective eye surgery and prevent corneal haze formation after cataract surgery. For the first time, a non-surgical treatment is available for those whose vision is slowly fading behind the curse of lens opacities, the most common cause of treatable blindness and the reason behind 1.3 million US operations per year - the most common surgical procedure in the elderly. Ortho• Eyes may help improve the vision of those with cataracts, age-related macular degeneration and possibly other eye disorders. Those about to undergo cataract surgery or laser eye surgery can recover more quickly and fully with the help of Ortho• Eyes. 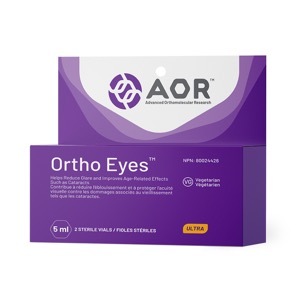 Ortho• Eyes may also benefit those with aging eyes and the rest of us with healthy eyes who want to keep them that way. DIRECTIONS: 2 drops in each eye twice daily or as directed by a qualified health care practitioner. WARNINGS: To avoid contamination, do not touch tip of container to any surface. Replace the cap immediately after using. Open only one container of solution at a time. Do not allow other people to use your container. Once open, discard container and any contents after 30 days. Do not heat beyond room temperature; keep the extra container in the box away from light, especially sunlight. Do not use if seal is broken or if solution changes color or becomes cloudy. Application may cause temporary irritation of the eye. If the eye tissue becomes more inflamed, red, irritated or uncomfortable after using this product, or if the condition worsens or persists for more than 72 hours, discontinue the use of product and consult a doctor. If pregnant or breastfeeding, ask a health care practitioner before use. KEEP OUT OF REACH OF CHILDREN. Use before expiration date marked on container. If swallowed, get medical help or contact a Poison Control center right away.